Fructose, proprietary non-GMO protein blend (rice protein, pea protein, and soy [isolated soy protein and fermented soy]), oat bran, Dutch cocoa, di-calcium phosphate, apple pectin, magnesium oxide, natural vanilla flavor, vitamin C, vitamin E acetate, spirulina, choline bitartrate, inositol, ferrous fumarate, biotin, vitamin A palmitate, niacinamide, zinc oxide, manganese sulfate, pantothenic acid, citrus bioflavonoids, pyridoxine HCl, riboflavin, thiamine HCl, vitamin B12, vitamin D, papaya, bromelain, folic acid, potassium iodide, chromium chloride, sodium selenite, sodium molydbate. Add one measuring scoop to 8 oz. of whole milk, skim milk, or juice, and mix (or shake) until smooth. 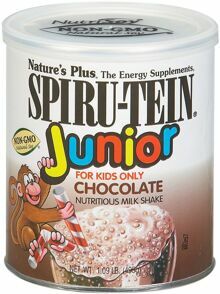 Chocolate Spiru-Tein Junior, formulated for the delicate needs of a child, is a great-tasting, highly nutricious milk shake. Just one 8 oz. serving supplies 7 grams of complete protein from nature's most healthful vegetarian protein sources. Each serving also provides 50% of the Daily Values for all vitamins and most minerals (including calcium, B-vitamins, vitamin A, vitamin C and zinc), high energy carbohydrates, and a natural whole food base of oat bran, citrus bioflavanoids, pineapple and papaya. Chocolate Spiru-Tein Junior teaches children at a young age that sound nutrition can be fun and delicious, too! 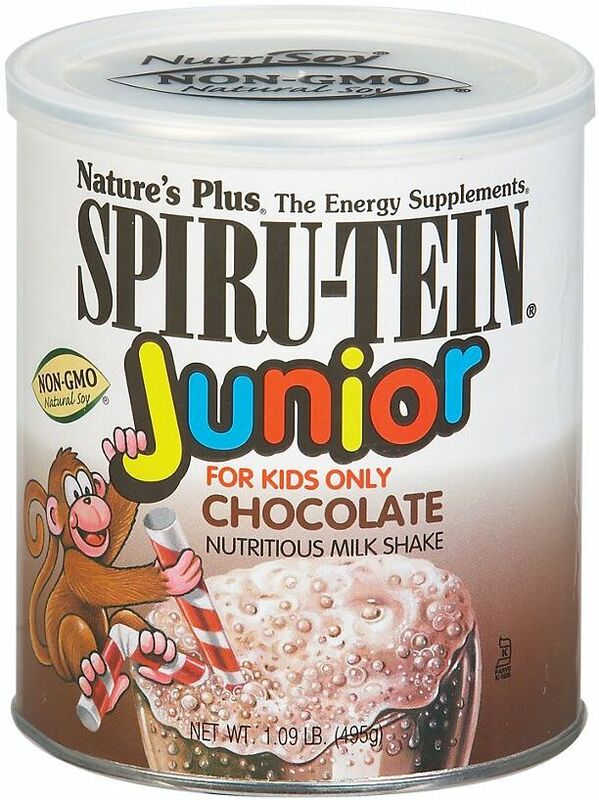 Chocolate Spiru-Tein Junior mixes instantly. No blending required.